Kate McLoughlin's Authoring War is an ambitious and pioneering study of war writing across all literary genres from earliest times to the present day. Examining a range of cultures, she brings wide reading and close rhetorical analysis to illuminate how writers have met the challenge of representing violence, chaos and loss. War gives rise to problems of epistemology, scale, space, time, language and logic. She emphasizes the importance of form to an understanding of war literature and establishes connections across periods and cultures from Homer to the 'War on Terror'. The final part of 'Lessons of the War' is 'Returning of Issue', which takes the form of a discharge talk by the sergeant. The men are standing inside now because it is autumn, and through the window the recruit-speaker notes a coming down to earth of 'small things' turning and whirling in the wind. He is unable to tell whether these small things are 'leaves or flowers': it is as though his perception has been thoroughly miltarised, so that he is no longer capable of appreciating the realm of almond-blossom, japonica  and love. Indeed, the sergeant remarks, 'I think / I can honestly say you are one and all of you now: / Soldiers'. In this section, as in the others, Reed exploits the military and civilian meanings of a phrase: here, 'Returning of Issue' denotes not only the giving back of kit after service but the prodigal son's return to his father. The recruit-speaker is unable to return to his father  significantly, his parent's fields are 'sold and built on'  and so elects to stay in the army. The actual terrain on which his peacetime identity was grounded has been irretrievably lost, and so he decides to remain, not a person, but 'a personnel'. In turn, he will himself 'teach: / A rhetoric instead of words; instead of love, the use / Of accoutrements'. His consciousness has forever changed  'I have no longer gift or want'  and so his place must change too. Authoring War is due to be released in the States on March 31, and is available for pre-order on Amazon.com. In 1963, The Goon Show's Spike Milligan co-starred with folk guitarist Steve Benbow in a London stage show at the old Lyric Theatre. 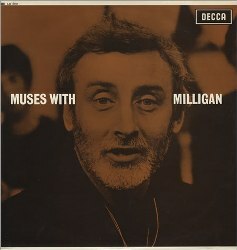 Aptly titled Spike Milligan Meets Steve Benbow, this pairing led to the development of a BBC2 television program made up of "irreverently assorted coruscations of jazz and poetry," Muses with Milligan, which ran from December 1964 through October 1965. Muses with Milligan was an "attempt to work poetry into the normal currency of entertainment," featuring musical acts alternating with Milligan meeting the leading English and Irish poets of the day. John Betjeman was a frequent guest; Adrian Mitchell and Robert Graves made appearances. And here, in an issue of Socialist Commentary from 1967, is this sentence: "Henry Reed reciting his Naming of Parts is a treasured memory from the very mixed Muses with Milligan series." I don't suppose you'd mind dropping me a copy of that show, Auntie Beeb? A collection of Milligan's witty, nonsense poetry from the show (generally described as Edward Lear-ish), was released in 1965 on a Decca LP (pictured). 4 New Statesman 1 April 1944: 'Columbus and The Rescue make claims of radio serious and impressive.' Punch (17 May 1944) said that 'the play could stand on its poetry alone'. In The Spectator (22 April 1944), however, Henry Reed described the play as 'rather disappointing'. Columbus, he went on, 'convinces one that some of the advantages which the radio writer thinks he enjoys are really handicaps'. See also The Times, 4 Sept. 1963, for a later assessment. The problem being, there was no Spectator for April 22, 1944. The Spectator was published on Fridays, and April 22 was a Saturday. A look at the issues for the first half of that year shows no book reviews for Columbus. The 1963 article in The Times turns out out to be MacNeice's obituary. There was, however, a New Statesman on April 22. We'll have to have a look at that.